LookClickPrint System used by some of the World’s Finest Museums. LionSky Media was the driving force in the creation of LookClickPrint, Inc. (LCP) from a business organization planning and technical standpoint. LSM provided the initial feasibility research and technical testing, created the initial business plan used to raise investment capital, forecasted the financial projections and marketing strategies to maximize the exposure on a worldwide basis. LSM designed and developed the museum kiosk ordering network across the world to accept custom orders and provide a “print-on-demand” solution to museums. 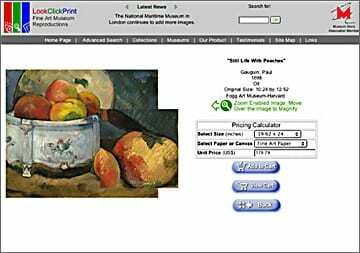 LookClickPrint, Inc. produces Museum Reproductions of the world’s finest art that either is in a museum’s archive (80% of museums art) or hangs on their museum walls. LCP currently has the Art Institute of Chicago, Israeli Museum, Denver Museum, The British Museum and British Library, Tate Museum, Orlando Museum, etc. LCP has hard to find images from Michelangelo, Degas, Monet, Gauguin, Bierstadt, Turner, etc. This product enables anyone to decorate their home with world-class art that they could never own, even if they could afford the money, because the artwork is exclusive to museums. Fine Art Collection with Reproductions available on Fine Art Paper or Stretched Canvas. Now world-class artwork is approved by each of the Museum Curator as color accurate and with our Epson UltraGilcée process, the print lasts for at least 100 years without fading. Visit LCP at http://www.lookclickprint.com to view the constantly expanding collection and the virtual world museum that helps all museums gain exposure and revenue. There are some wonderful small museums in remote places that people never get to visit, yet they have incredible art collections. The LCP system lets the public experience art from all corners of the world. 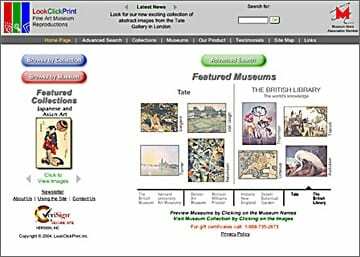 Major Search Engines like Google.com has ranked LookClickPrint in the top position with hundreds of thousand competing web pages for “Fine Art Museum Reproduction” and/or “Museum Reproduction”. LionSky Media’s president and owner, Ken Levandoski currently sits on the Board of Directors for LCP and LionSky continues to remain an integral part of the company by providing technical services for custom worldwide kiosk design and installations, web site maintenance, web traffic promotion, and marketing services.